Miku ensured Bengaluru maintained their fantastic start to their maiden ISL campaign with his fourth goal in as many games to hand his side a win over NorthEast United in Guwahati today. The win means that Albert Roca’s side are back at the top of the table with nine points from four games. 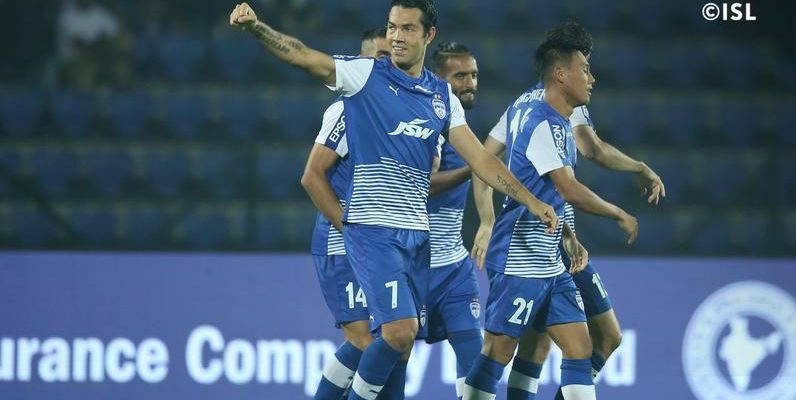 With Roca handing Spanish midfielder Dimas Delgado his Bengaluru debut, the Blues boss had to bench a foreign player and Juanan Gonzalez made way for Subhasish Bose in defence. Lalthuammawia Ralte in goal was a decision that Roca left late. Learning from the defeat in Goa last week, Bengaluru got the game off to a more patient start, passing the ball around before switching gears in attack. Miku came close in the 13th minute only to drag his shot wide of the post while Sunil Chhetri saw his shot on target blocked by TP Rehenesh in a first half that saw the hosts crawl back into the game towards the end. But all Bengaluru needed was two minutes into the second half to grab the lead in Guwahati. With the ball at his feet and Miku closing him down, Rehenesh’s panic clearance could go only as far as Udanta who squared the ball to the Bengaluru number 7. Calm as ever, Miku picked his corner, leaving Rehenesh with no chance at all. Thereafter it was an even affair with both sides trying to make inroads into the rival half. While the Blues controlled majority of the proceedings, they fell short of increasing their advantage further. Lenny Rodrigues who came on for skipper Chhetri had the best chance to double the lead in the 71st minute but the midfielder lost his footing and the shot was miscued. With the hosts pushing for an equalizer, a calm and composed performance from Ralte in the BFC goal kept all their attacks at bay. The 25-year-old pulled a point-blank save to deny Danilo Lopes right at the death and keep the Blues narrow lead intact and with it, the three points. Bengaluru FC now playFC Pune City away in their third consecutive game on the road on December 14th.